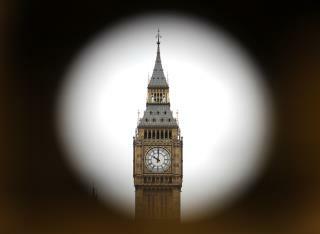 (Newser) – With a dozen deep bongs, Britain's Big Ben sounded the hour for the last time Monday before falling silent for repair work due to last almost four years. The giant bell atop Parliament's clock tower rang out at noon, as it has almost every hour since 1859, becoming an iconic sound of London. Hundreds of parliamentary staff, journalists, and lawmakers gathered in a courtyard under the Victorian clock tower, while hundreds more tourists and passers-by lined sidewalks and filled nearby Parliament Square. The mood was lighthearted, but total silence fell as the first bong sounded, per the AP. The crowd burst into cheers and applause as the last faded away. The break will allow workers to carry out much-needed maintenance to the clock and clock tower. But a handful of lawmakers have criticized the lengthy silence, calling Big Ben an important symbol of British democracy. It's really because of the eclipse. Don't let them fool you with that 'maintenance' crap. They can't send a guy with a hammer up to whack the bell at noon every day? If you recognized the subtitle. Yer old.